FlyCatcher Inc., a tech toy company that focuses on developing toys which combine physical play with digital experiences, has announced the latest addition to their product line - the CharmBricks™ bracelet. 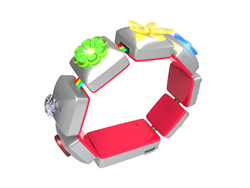 CharmBricks™ is an electronic charms bracelet that kids (ages 5 to 9) can customize, design and program in order to personalize the accessory while improving their learning skills. This is Flycatcher’s second product line after the success of Painting Lulu™, the company’s interactive coloring book line that was launched last year. The CharmBricks™ bracelet is constructed from several smart electronic bricks that can be customized with different stylish charms. The various bricks are formed into a bracelet using a rainbow connector which binds them together. Children can customize their own by placing different charms inside each brick and consequently program each brick with a unique functionality, such as blinking colors with different patterns e.g. turning on LED lights in every color and various effects the child will choose. The CharmBricks™ companion app will focus on creating playful STEM challenges (science, technology, engineering and mathematics) and will teach kids the foundation skills of coding through planning, problem solving and sequencing as they design their tech toy bracelet with the App. The FlyCatcher team will present their toy line, at the annual Toy Fair in New York (booth #6044). Stop by the booth to learn more about the new CharmBricks™ educational toy and Painting Lulu’s digital coloring book line-up. FlyCatcher Inc., a tech toy company that was founded in 2013 in New York, is on a mission to help parents develop their child's learning skills by developing toys that bridge the gap between real-life and the digital space. FlyCatcher Inc., is the maker of Painting Lulu™, the award-winning paper & digital coloring book line. The company has partnered with some of the biggest brands in the toy industry including: Hasbro, Mattel, Rovio and more.